If you use Derby Day! and find that it improves your pack's pinewood derby, I'd love to hear from you! Just send a note to derbydaysoftware@gmail.com. It would also be great if you include a picture of your projected screen! I'll post all of your feedback here for others to see! My name is Erika, I am the Cub Master for pack 6036 in North Creek NY. I would like to say THANK YOU!! This software was awesome, and helped us tremendously. There was so much extra work that we did last year that was eliminated by this program. Our derby was very smooth, and the software kept things moving, no more intermission to reconfigure the cars, and figure out who has been eliminated. I think it is fantastic that you were willing to share this for free, and it was so easy to use. Wanted to drop you a note of thanks for your software. It saved the day for the Dan Beard Council; Blue Jacket Region; Pack 281 2015 Pinewood Derby! Our FastLine timer/finish gate system was broken; we had no money or time to fix it; it was my first year running this for the Pack and the race software we had was way too complex to begin with, and I dreaded trying to figure out how to use it without the automatic finish gate functionality. I was suddenly scrambling and trying to figure out a manually developed and administered bracket system when I found your software. Man what a game changer this program was. The event ran great, and the kids had fun. No one ever knew I had been sweating it all week. I will be proposing we use some of the proceeds from the race refreshment sales to make a donation to support your site. Also, a quick question: Do you know if your software might be compatible with our current hardware-a SpeedLine system with a starting switch, and time and place finish display? We need to make a spending decision to either repair the one we have or purchase a new one and are considering a new MicroWizard brand finish gate (four lanes; blinks to determine winners, etc.) in lieu of fixing the old one and would appreciate your input. I'm a fairly new Pack Committee Chairman and was looking for software to support our Pinewood Derby. I came across Derby Day and played with it, setting up racers & heats, etc. I was very impressed from every angle. We used it for our Pinewood Derby held last night, and it worked flawlessly. We prepared by making name tag and car number stickers in advance, and registering the boys under that number in the system. I set up operations on a small laptop with a large TV screen attached, facing the audience, up towards the starting end of the track. As the boys came in with their cars, our Inspector weighed them and checked them for rule compliance, and stuck the name tag/car number sticker on the boy, and the number sticker on the car, and voila, they were registered. Because we used Derby Day, the pace of the event was great. Everyone could see who was up next in which lane, and our Queue Manager just had to shepherd the boys and cars in place, and our Starting Line official started them off, and the finish line judge read off the places in the lanes, which our score keeper entered into Derby Day, and then it was on to the next race. We were able to run a race about every three minutes or so. We started out with 14 cars, and were actually able to end the meeting on time. Unbelievable for a Pinewood Derby. All the boys were able to get lots runs, so they were all pretty happy, even if they didn't win. Everybody was able to see the racecourse, the score-keeping and standings, etc. the entire time, and a good time was had by all. We got lots of compliments from parents and leaders, and we're very pleased we used Derby Day. I'm sending a contribution. Love the software. Really was great and made the experience fun and fair for all the boys. Great job. We had it setup with a rear projection screen over the finish line of the track so everyone could see. Really awesome. We are going to use it in manual mode for our space derby in a couple of weeks. I am an assistant Cub Master for pack 162 in Charlotte, NC and am also the coordinator for our Derby which we ran last night. I was going to try and improve upon my excel based tool I've built for myself and project it but then I found Derby Day! We used it last night to facilitate the racing and it was amazing. It's simple to explain so the cubs all understood the scoring and could keep track. After the first heat results posted to the big screen they were completely engaged. As the race progressed, the leaders emerged and as races were announced via the spectator window there was a lot more interest because the cubs understood how competitive a race would be or when a leader was racing! As we got down to the finalists the crowd really appreciated the final races and how fair lane selection was so that there was no question at all about who won and why! For the first time in my 4 years doing it, we had a "statistically significant result" and unimpeachable winner. We also had a couple of late "lead changes" which created a lot of cheering. That has never happened! After the race I got a ton of great feedback on how exciting the racing was and how smooth it all went, all thanks to Derby Day! I am always amazed by the creativity and innovation of Scout Leaders. I can't say enough good things about your effort in building Derby Day and your generosity in offering it for free. I've made a donation as a result. For what it's worth, we had 13 cars, set the elimination level at 10 and it took about 45 minutes to get to a winner. Perfect. It was actually shorter than I expected to get from the point of the first elimination to the winner so no one was side-lined too long. Thanks for your support of the BSA. This software works great! It made our Derby a blast. I got bumped from a track with someone who has all the software to being in charge at the last minute. It saved our pinewood derby. This past Tuesday our Cub Scout Pack ran our Pinewood Derby. As a new Cubmaster, I was a bit apprehensive about 'running' the race along with all the bracket'ology'. Using your software was a breeze! From start to finish the races went off without a hitch and your program made it all possible. So from Pack 3028 in Saugatuck, MI please let me say thank you! Derby Day! software is the best program out there for running a pinewood derby. I looked into other commercial programs, but Derby Day! is simple, easy to use, and has an incredible spectator screen that shows each boys’ names, den, car weight and order of finish. In past years, we paid someone to bring in a track and scoring system. This year, we dusted off and refinished the old Pack track and ordered a Microwizard gate. We bought the cheapest Microwizard gate, so we had to enter the finish order into the computer by hand. Even so, Derby Day! makes that easy. We had 54 cars, and shaved an hour off the usual time to run the derby with Derby Day! I just wanted to let you know that we used your software to run our pinewood derby this year & it was a huge success. This was my first year running the event for our pack & I got overwhelmed with comments about how fast and smooth the event went. These comments were in large part to Derby Day. Needless to say I had no problem with our Pack Committee agreeing to donate to your pack. If you ever decide to do an update one thing that would be nice would be to allow user specified car numbers (we have traditionally allowed our scouts to pick whatever number they want...most pick their birthdays and there is always a rush to get #1) instead of auto assigning them. We simply added the numbers to the name field and, aside from the second heat where the race director (me) got confused for a moment, it worked great. Thanks again for creating the software and putting it out there for everyone to use. You sir are a genius. I used the software tonight for a pinewood derby and it went better than I have ever seen. Thank you for this great software. Sorry I could not donate more. Pack 18, Everett Washington, used your software last night and everyone was very impressed. I want to thank you for your hard work. I donated $18.00 to your cause. When viewing the spectator window (which is awesome) the lower half that shows the heat races and the cars order by points is hard to see. Would it be possible to increase the font size? the upper half that shows the current heat is perfect. We loved the icons for the den class. It would be nice if there was a registration field for the cars name and If the cars could be sorted by that name so the spectator window showed the car name instead of the scouts name. Pro: Love the ability to review Standings and Car Heat History. I will be reviewing this to see how many times the scouts ran. We had four lanes and tried 9 points. It seemed to run a little long (especially when we were down to two cars). Next year we will probably try 7 or 6 like you suggested for the 3 lane race. Again, we really, really, really loved your software. The scouts loved seeing the cars up on the spectator window cheering on their favorite! I will try to recommend your software to other packs. Here is a big "Thank you!" for producing and releasing a polished piece of free software. It and a lent projector nicely replaced a 20-year old pair of bulky, heavy 8'x4' homemade whiteboards, on which most of the bracket lines had become nearly invisible, and the race results of years gone by could no longer be entirely erased. We ran our Derby this weekend in a normally-lighted indoor soccer arena, and with the high-contrast Derby Day! Spectator Window and a 300-lumen projector, we were able to project through a ball-catcher net onto a yellow-painted wall, and the display was quite clear and legible for boys and adults seated 35 and more feet away. I was pleased that Derby Day! accommodates un-timed races. Our current electric-eye technology merely identifies the #1 finisher and does not time the results. Also pleased that we could configure the number of cars in each race. For our purposes, 2-car races with a few byes was a good configuration. In order to provide more races for everyone, I was interested in converting from our usual single-elimination scheme, and by assigning a 2-loss limit in the race settings we easily converted to a double-elimination scheme. And what's more, DD remembers what lanes each racer has used and tries to assure that lane assignments are evenly distributed. And what's more besides, it creates heats where boys with similar records race each other. This keeps racers racing longer and promotes close results rather than blow-outs. It seemed that there might be an obstacle to running separate age group and overall competitions, which allows us to give out more awards and spread them over the different age groups, but the simple-enough solution was to create a Derby file for each age group and for the overall group. Registration was handled expeditiously by entering in advance ALL the names from our roster, and then deleting just before race-time the small number of boys who were not entering cars. In short, Derby Day! WORKED for us! I was put in charge (at the last minute) of running the brackets for our Encantado district pinewood derby this past weekend. I did not know how to do a double elimination on four lanes, so I immediately turned to the net to find out. I also found out how many different ways there were to run a derby, and that the double elimination presented so many problems. I came across your site, and really liked how your software would help run the derby, especially since it would keep more boys racing, and for longer through the eliminations. I used both a projector and a printer, and both worked well. The boys and the crowd LOVED seeing their names up on the screen. 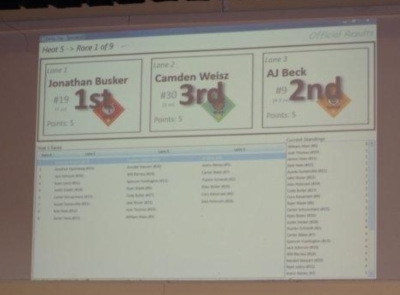 The software made the event go much faster and smoother, in part due to it picking the lanes, rather than the boys drawing a number for lane choice. The fact that the software would ‘learn’ and match up the faster cars, and change up the lanes they would run in was great! I really appreciate the software, and the BSE Council folks all wanted the URL to get a copy themselves. This software was just plain AWESOME! The boys really, really liked being able to stay in the races longer, instead of being eliminated in the first or second race, and then having to sit around for the rest of the day. Compared to our pack derby, which was run two weeks earlier on a double elimination, the moods of the boys was much better, and generally, happiness was all around. Our pack was the host, and we got many ‘attaboys’ for running the derby in this “new” way. Thank you again for your hard work on this program! The 2012 Pack 333 Pinewood Derby was run for the second year using Derby Day! software. New this year was the MicroWizard Finish Gate integration. We learned last year that Derby Day! drastically improved the efficiency of the derby and reduced the overall racing time significantly, but there was still room for improvement. The bottleneck was in manually entering the results after each race. To speed up the race even more, we integrated our Microwizard Finish Line gate into the program. In addition to speeding up the race, the crowd loved immediately seeing the results projected on the big screen as the cars crossed the finish line. The racing went fast and smooth, with the operator merely pressing the save button after the results were received from the gate. Good Stuff! Derby Day! made it's debut at our 2011 Pinewood Derby. Here is a picture of the spectator window.